Men's basketball streak comes to an end. AnnMarie Healy ’16, a unanimous selection to the All-Ivy League first team, was a major reason that the Harvard women’s basketball team reached the postseason for the fourth time in five years. On Christmas Eve, the Harvard men’s basketball team dined at Roy’s, in Waikiki, feasting on short ribs and mahi mahi. It had been an extraordinary 48 hours. After arriving in Hawaii with a 3-6 record, the weakest squad in the eight-team Diamond Head Classic, Harvard had edged Brigham Young University 85-82 in overtime in the tournament’s opening round and demolished Auburn 69-51 in the semifinals. Now, they had a day off before facing Oklahoma—then the third-ranked team in the country—in the championship. Unfortunately, that was the high point in a season without many others. Stymied by high-profile non-conference competition and facing an increasingly competitive Ivy League, Stemberg coach Tommy Amaker’s squad struggled with injuries and inconsistency and finished the year 14-16 overall and 6-8 in Ivy play. That ended Harvard’s string of five consecutive Ivy titles—and raises questions: was this year an aberration, or will the Crimson recede to the middle of the Ivy pack? Harvard’s biggest news of the season came before the first practice: Siyani Chambers ’16—a team captain and three-time All-Ivy point guard—tore his ACL during the summer, forcing him out of the lineup for the year. The Crimson quickly discovered just how difficult replacing him would be. After starting the season with a 20-point drubbing of MIT (a Division III squad), Harvard lost five of six games, revealing broader problems: freshman point guard Tommy McCarthy was turning the ball over; the team struggled to find consistent scoring apart from center Zena Edosomwan ’17; and Harvard’s defense—a traditional strength—was porous. A narrow loss at then fourth-ranked Kansas, followed by wins in four of five games (including the run to the Diamond Head final) gave the Crimson hope, but that optimism dissipated in a 65-62 loss to Vermont. The mounting strain of injuries, travel, and top-level competition had depleted Harvard just as Ivy play—the most important part of the year—approached. Although the Crimson started conference competition by besting Dartmouth 77-70, the team dropped its next five Ivy contests, including a heartbreaking 55-54 defeat to Columbia on a buzzer-beater, followed by a pair of double-digit losses at Princeton and Penn. To some extent, the losses reflected a depleted frontcourt: Edosomwan missed the Princeton and Penn games with a thigh injury and was hobbled down the stretch against Columbia. But Harvard was also performing terribly at the free throw line (the team went nine for 20 against Princeton), and its man-to-man defense remained ineffective, prompting Amaker to turn to a zone defense for much of the Princeton game. The Crimson, then 1-5 in the Ivy standings, had nothing left to play for but pride. 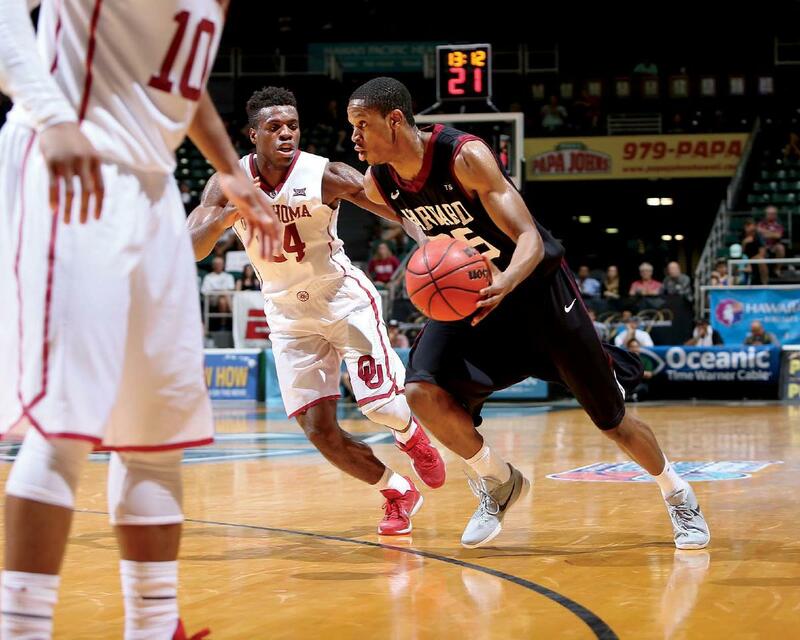 By winning five of its final eight contests, Amaker’s squad proved its resilience. The best illustration was a 73-71 upset of Princeton in the season’s penultimate game. The Tigers arrived in Cambridge at 10-1 in Ivy play, just half a game behind league-leading Yale. Harvard’s win opened the door for Yale to clinch the title outright (the Elis took care of business with a win at Columbia the following night). The Crimson’s unlikely hero was Patrick Steeves ’16, a back-up forward who had missed the last three seasons with injuries, only to provide much-needed scoring off the bench as a senior. The Princeton game was a case in point: Steeves led Harvard with 25 points, including the game-winning free throws with seven seconds remaining. Harvard had had six consecutive 20-win seasons before this year’s losing record, despite the inexorable change in team rosters each year. So what is in prospect for the 2016-17 Crimson? On paper, at least, the talent on next year’s squad should enable Harvard to compete for an Ivy crown. Several proven players will return: Edosomwan, who earned All-Ivy second-team honors this year and has the potential to become Ivy League Player of the year; Chambers, the team’s leader on and off the court; and Corey Johnson ’19, a shooting guard who had the most three-pointers by a freshman in program history. In addition, Amaker will welcome a seven-member recruiting class currently rated eleventh in the country by ESPN. Moreover, the Ivy title will likely be contested fiercely. The move to a postseason tournament reflects how seriously schools across the league, once dominated by Penn and Princeton, are taking basketball. Princeton, which graduates only one player, will be hungry after just missing the NCAA tournament this year. A young Harvard team will have to cohere and draw on the experience of Chambers and Edosomwan to thwart the veteran Tigers. For now, Harvard’s returning players will look to improve and learn from this year’s setbacks, knowing that the arrival of high-profile recruits will create competition for playing time. The Crimson faithful will begin to learn how successful these processes are when Harvard opens the 2016-2017 season against Stanford on November 12 in Shanghai. The women’s basketball team began the season with one of the most inexperienced rosters in head coach Kathy Delaney-Smith’s 34-year Harvard career. After going 5-8 in non-conference play and splitting its first two Ivy games, it appeared that the women’s team, too, would shift its focus to building momentum for next year. But then the Crimson won eight of its next 10 games and entered the final weekend of the season—a road trip to Penn and Princeton—with a chance to capture its first Ivy title since 2008. Two losses thwarted those hopes, but because the Quakers and Tigers both received NCAA tournament berths (the first time two Ivy League teams were selected), Harvard was invited to the National Invitational Tournament (NIT). Unfortunately, the team fell 76-50 to Hofstra on the road in the opening round of the tournament. 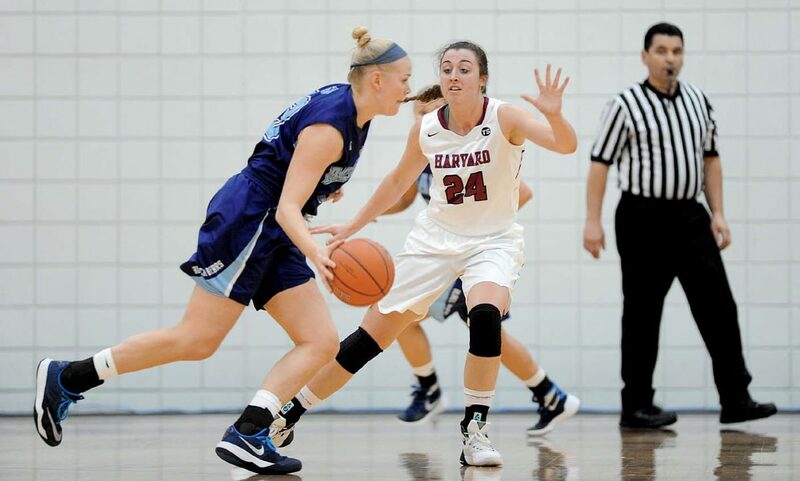 AnnMarie Healy ’16 led Harvard with 10 points, and Kit Metoyer ’16 and Destiny Nunley ’17 added nine points each. But the Crimson shot just 26.5 percent from the field, while the Pride made 52.5 percent of their attempts. Coming off their fourth postseason appearance in five years, the Harvard women (who finished the year 14-14 overall and 9-5 in conference play) appear well positioned to build toward a future Ivy title. The team graduates three seniors: Healy, a first-team all-Ivy honoree; Metoyer; and Shilpa Tummala, an all-Ivy honorable mention designee (profiled in “Taking Her Shot,” November-December 2015, page 33). But the returning talent—led by three freshman guards who gained experience this year—is substantial. In addition, Delaney-Smith will welcome to Cambridge a talented recruiting class led by Jeannie Boehm, one of just three players in Ivy League history selected to participate in the prestigious McDonald’s All-American game.